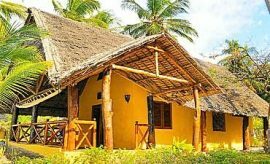 Nestled in a wooded incline beside the marine park on Mafia Island, south of Zanzibar Island is the mid-range seaside lodge – Pole Pole, meaning “Slow, Slow” in Kiswahili. You will be charmed by its rustic coastal ambience that seems to capture the inherent essence of island living. Thatched roofs and walls supported by wooden poles, woven mats on the floors and wall exteriors and sandy walkways weave a spell around your AfricanMecca dream holiday on Mafia Island. Spend time in the soothing warm waters of the Indian Ocean exploring its many wonderful denizens or tan yourself on loungers beside the curved swimming pool. If you would rather nap on the beachfront, choose the woven rope daybed underneath a shady thatched parasol. 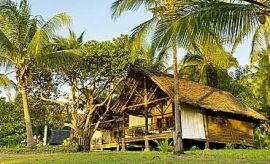 Pole Pole has just 7 Bungalow Suites, each located in a copse of coconut palms to accord you all the privacy you need. Each of the ocean-facing bungalows is furnished with large double or twin beds covered with mosquito netting which curtains the entire sleeping section. Handcrafted artifacts in nooks and corners and coastal furniture add to the simple elegance of the rooms. The ensuite bathrooms have twin vanities, a shower stall including a bidet. If you need a hairdryer, you can request it at the reception. Two of the units include two bedrooms each that are suitable for families or guests of four traveling in Tanzania. Partake on delicious meals including Italian and Swahili themed cuisine in the resort’s decked dining area while ordering drinks from the pastoral wooden-built bar. Specific dietary needs are catered for vegetarians, halal, allergy-free meals and others too. 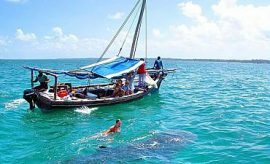 One of the most awe-inspiring moments of your AfricanMecca tour on Mafia Island is undoubtedly when you swim with the whale sharks that can grow to lengths of 12 meters. From October to March, snorkelers and divers can relish watching these magnificent creatures up, close and personal as they feed on plankton. You could also watch humpbacked whales as they migrate along the coast of Mafia Island if you were to vacation in Africa, in the months of July to October. Another enjoyable activity is walking on the Mange Sandbank that appears at low tide, where you can revel in the stunning white of the sands surrounded by the ocean. Take pictures of the many tiny creatures that wait in the pools for the return of the tide. Take a trip to Juani Island and you could watch the turtles hatch from their sandy nests on the beach during the months from June through September. To the south of the island is a stunning blue lagoon where you can view upside down jellyfish. At Kua are the remains of an ancient 12th century civilization that vanished without any apparent reason. Even as you wander through them on your trip, you are likely to encounter small wildlife such as vervet monkey, wild pigs, blue duikers(a small kind of antelope). Green turtles use the beaches as their nesting grounds. The Ras Mbisi has a rather curious species of denizens, the hippos. How they arrived here exactly is not fully known but they are shy, elusive creatures and were first spotted in 1895. 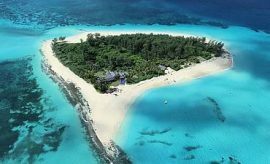 There are claims that a reed lagoon from the mainland channeled through the island which was later cut off thus their present castaway confinement in the middle of the Indian Ocean. For a look at German architecture from the late 19th century, you must visit the Ras Mkumbi Lighthouse on the northern tip of Mafia Island. 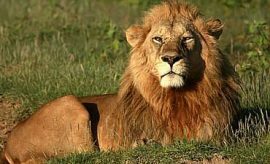 When beach vacationing at Pole Pole in Mafia, we recommend experiencing some of the surrounding Mafia Island attractions and tour activities after your Northern Tanzania safari to Tarangire, Lake Manyara, Ngorongoro Crater and Serengeti.